I am always amazed that there is so much to learn about wine as I search for wines to serve to guest who are staying at our Sandwich bed and breakfast. Over my years of tastings, I understand what I like to drink the most, based on my personal taste. I also know what food combination's I favor. I do not pretend to be an expert on food pairings, but am always impressed with how a food or a wine or both can drastically improve when properly paired. The weekly wine tasting that I attend at the Belfry Bistro is a great place to experience the results of good pairings. I would love to be able to remember and replicate the pleasure of the pairings, but even after attending many tastings and trying to take copious notes, I have not mastered this skill. But fear not, I may have found a solution to enhance this skill set or at least a short cut to better pairings. As often is the case, what is a problem for someone becomes a market opportunity for others. Enter the Food Network to address this marketing opportunity. The Food Network is a well known ‘brand’ in relationship to the preparation of food. Jan never misses an episode of The Iron Chef and our quests have benefited from the cooking tips she absorbs from their fine programming. 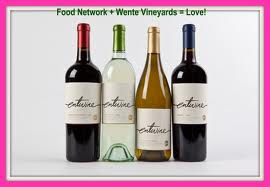 The Food Network has partnered with Wente Vineyards in a new venture named entwine. That night we tasted the 2009 Pinot Grigio, the 2009 Chardonnay, the 2009 Merlot and the 2009 Cabernet Sauvignon. Each was paired with one of entwine’s recommended food pairings. After the tasting, I did more research on their website and studied the label on a bottle of Merlot that I wanted to try again. The website is very informative and offers almost 300 wine and food pairings, each with an easy to follow recipe, as you would expect from the Food Network staff. Each label also has a nice simple description of the wine, i.e. the Merlot is – ‘juicy and mouthwatering-think mid-summer plums and cherries with a hint of black tea’. It also includes a list of seven food items to ‘entwine’ with this Merlot; a very helpful start for anyone looking to match up food and wine. It is sort of like a Food & Wine pairings for Dummies, but very helpful and very well done. The wines were, as designed and promoted, easy drinking and very food friendly. All were also moderately priced at less than $13.00, a price point that could make it a house wine for our Sandwich bed and breakfast. I am as intrigued by the marketing concept as much or more than by the wines themselves. In a down economy, it is no secret that fine wine sales are not what they used to be. A recent victim to the down turn was a nice wine shop in Hyannis next to Trader’s Joe's, The Wine List. They offered simple descriptions of the wines, even displaying them in order of increasing intensity and flavor profile. They also suggested food pairings. I think their concept was similar to entwine, but on a much smaller scale. It will be interesting to see if the cross promotion and marketing power of the Food Network can pull the entwine line through the distribution channels. As I wait to see the results, I will enjoy experimenting with their pairings and drink more of the wine. Again, it is tough work, but someone has to do it.